Last summer my Handsome Dude found a large dog t-shirt while thrifting. I upcycled it into a t-shirt his size and wrote about it in this tutorial.﻿ This past weekend we were watching is favorite "big boys" play baseball. One of those boys gave our Handsome Dude one of his past jerseys. It was a men's large. As you can see in the first photo it was very, very big on my Handsome Dude. It was so loved and wanted we found a way to put in on while at the game. The next day, however, Handsome Dude wanted me to downsize it (and wash it) so he could wear it to watch them again that night. With my trusty Fun and Easy Knit T-shirt pattern ready to go, it took me only 30 minutes to make a large men's into "just right" for my Handsome Dude. The only tricky part was getting the logo and number to fit in. I didn't want to alter the neckline, so the number and logo are a little low. Adding extra length to the t-shirt allows us to tuck in and pull the shirt out enough for the number to show nicely. 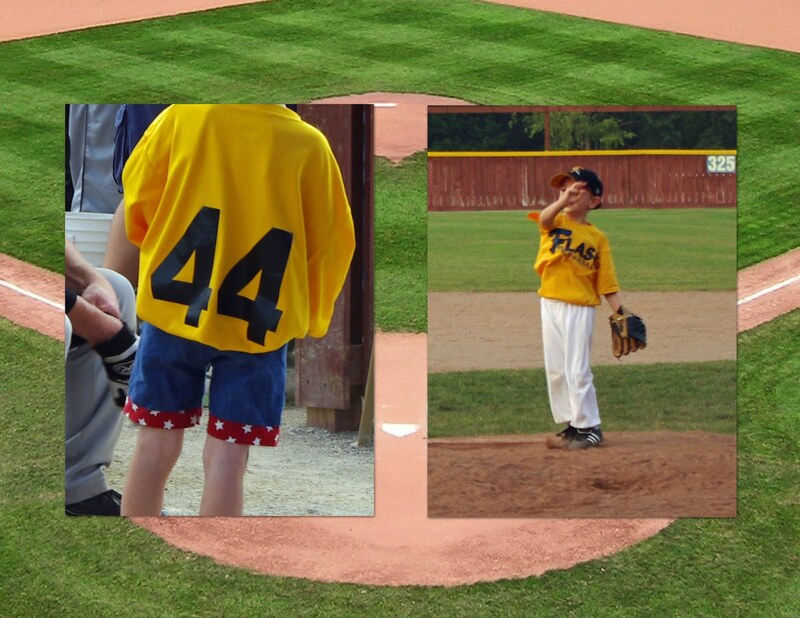 His new jersey looks great with his baseball pants made with our Cute and Quick Pants Pattern.